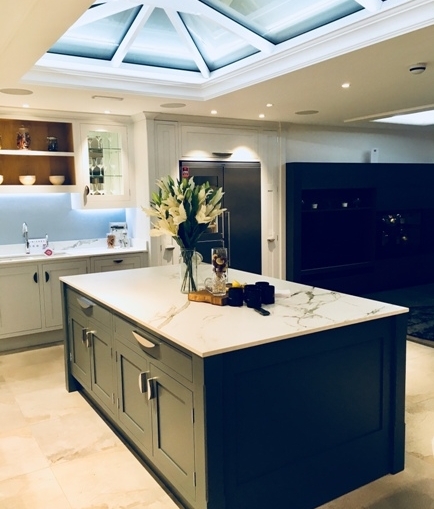 Interiors retailer House of Harrogate has completed a four-year refurbishment of its underground showroom, to introduce a cutting-edge home cinema and smart home technology with a conglomerate of exclusive brands encompassing UK-made furniture, concrete interiors, window specialists and sliding door innovations. The interiors store, which mixes smart living and traditional aesthetics with liveable luxury, officially opened its underground showroom on Saturday. The launch event introduced a selection of room sets including a state-of-the-art home cinema by Acoustic Pixel, beautifully curated furniture by the English Cabinet Company, specialist concrete surfaces and furniture by Relentless Interiors, window & door treatments by Shire Doors and bespoke plantation shutters by Shutter Up Your Place. During the launch event, House of Harrogate also hosted cooking demonstrations by Bora, serving samples of Slingsby Gin matched with Lixir Tonic. Sitting under one roof, House of Harrogate specialises in delivering a full design service, where the team combine a client’s brief with ideas, influences, practicalities and constraints to formulate a workable concept that includes furniture layout, decorative finishes, flooring, window treatments, lighting and accessories. Owner Mark Edwards said: “Our team take great pride in creating an experience for interiors shopping like no other. With this concept, we wanted to create a beautiful space that not only showcased products and the independent brands we work with, we also wanted our customers to experience a real-life aesthetic.